At college, life often revolves around books, friends, coffee and our favorite treats! The good news is that Princeton has the perfect eclectic café that meets all of these needs in one place. If you're a fan of fair trade coffees, specialty beverages and homemade treats--and you're wondering where you will find that favorite study spot--I think that we have just the place for you. 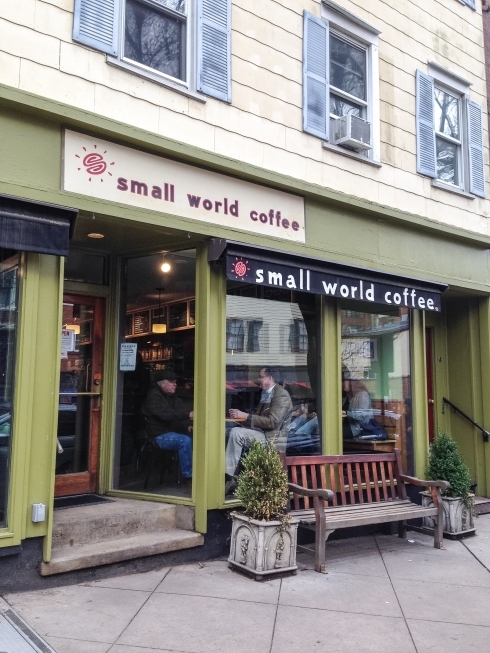 Chances are that you will fit right in with Princeton students' collective love of Small World Coffee, a hip coffee shop just outside of Princeton’s gates on Witherspoon Street! Small World is where so many of us students go to study, chat and write. I love that it lets us get into the “real world” without going very far from campus; there’s something so refreshing about getting off campus and doing homework in a place that’s full of not only students, but also families, businesspersons and friends. Small World also has neat events like open mic nights on Mondays and periodic art shows. And let’s not neglect the fact that their menu is great too. They sell not only all of the warm and cold beverages to fuel you through any season, but there’s also delicious oatmeal bowls, fresh-baked granola, cookies and the like! You'll likely find yourself as excited about Small World as most of us students are. If so, Witherspoon Café in the Frist Campus Center on campus also sells Small World coffee. So, on those mornings that you are craving your favorite drink on your way to class but don’t have time to get to Nassau Street, you don’t have to miss out! We all love seeing this logo! One important thing to know about Small World is that they only take cash, so plan accordingly if you are visiting campus this spring and want to enjoy a treat at one of my favorite cafés!